Rugani Beetroot Juice: Accessible, convenient and natural nutraceutical sport nutrition. “In the world of athletic competition, margins of victory are becoming smaller, and in some cases may literally come down to a fraction of a second or the ability to contract a single motor unit one more time. Thus, athletes are constantly in pursuit of any advantage to improve athletic performance. Some athletes may turn toward nutritional supplements, from both natural and organic sources, to provide this edge.” (Beetroot Juice And Exercise Performance). There is no substitute for self-discipline, customised training and precision nutrition when it comes to endurance sport. It is however at least now more convenient to access a 100% natural and fresh nutraceutical juice to boost recovery and potentially enhance stamina. One of the products in the Rugani Juice range that is of particular interest to athletes, is the 100% Beetroot Juice. “Beetroot is rich in nitrates which has been linked to the dilation of blood vessels for increase oxygen transport around the body, hence it may improve performance,” says dietitian Monique Piderit (Nutritional Solutions). Research done by the Department of Nutrition, Food, and Exercise Sciences’ Human Performance Lab at Florida State University, confirms that beetroot and its elements have become increasingly popular in the arena of exercise performance mainly due to the high concentrations of nitrate. Beetroot juice contains high levels of inorganic nitrate (NO3−) that has proven to be effective at increasing blood nitric oxide (NO) concentrations. The nitric oxide can increase blood flow, improve lung function, and improve muscle contraction. This combination makes beetroot juice a popular supplement for athletes to improve *cardiorespiratory endurance and performance. (*This refers to the ability of the circulatory and respiratory systems to supply oxygen to muscles during extended exercise). In a research study done by the Exercise Physiology and Biochemistry Laboratory, Department of Physical Education and Sport Sciences at Serres, Aristotle University of Thessaloniki (Greece), the most prominent and consistent effects of dietary nitrate supplementation is confirmed as a reduction in the “oxygen cost” of exercise. Beetroot juice is also rich in antioxidants, loaded with Vitamin C and Folic Acid, iron and carotenoids, as well as the naturally occurring nitrates and betaine (especially the beneficial natural pigment betacyanin). 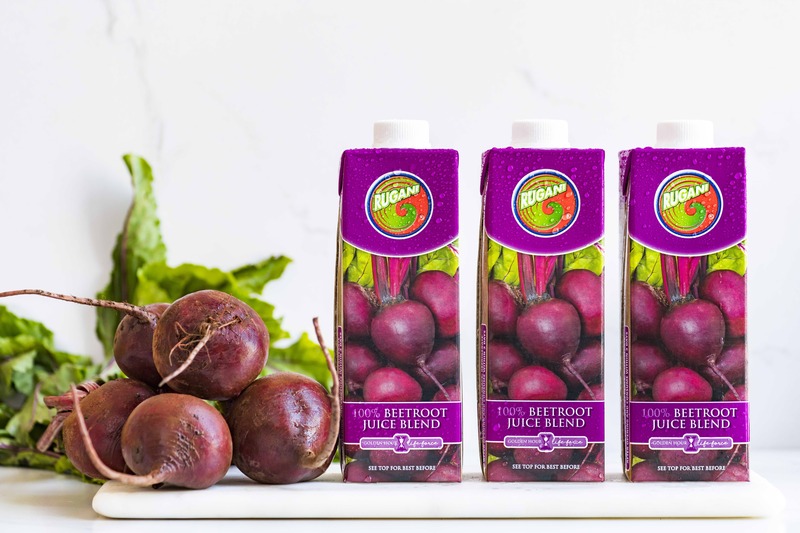 Drinking beet root juice, either straight-up or in a healthy smoothie, essentially helps to purify the bloodstream and improve cardiovascular health. It also aids in detoxifying the liver and assisting gut health. There is considerable research confirming its assistance to the body in preventing cancerous growth. Smoothies are an easy way to start to include beetroot regularly in a training diet. The 100% Rugani Beetroot Juice can be used as the liquid for the Berrylicious Smoothie recipe supplied by Nutritional Solutions: https://www.nutritionalsolutions.co.za/super-smoothies-right/. Ormsbee, M.J., Lox, J. and Arciero, P.J. 2013. ‘Beetroot juice and exercise performance’. Nutrition and Dietary Supplements, (5): 27–35. Zafeiridis, A. 2014. The effects of dietary nitrate (beetroot juice) supplementation on exercise performance: A review. American Journal of Sports Science, 2(4): 97-110. © Rugani(Pty) Ltd 2017 | All rights reserved.